√ [ Update Version ] - Higher Quality, More Stable, 1 Year Replacement Warranty. Fit Most Ceiling Fan Lamp. √ [ Easy and Fast ] - Installation is very easy and fast, It is a nice looking remote and with rubber textured buttons that are easy to press and it comes with a holster you can mount to the wall. √ [ Multi-Fuctions ] - Includes separate buttons for 3 fan speeds,designed to separately control your ceiling fan speed and light ; Includes wall cradle for handheld remote control,This kit converts regular ceiling fan into a remote controllable one. √ [Long Operate distance]- up to 30Meters(100-feet)in open air.Works with down rod mounted fans; receiver mounts in fan canopy. 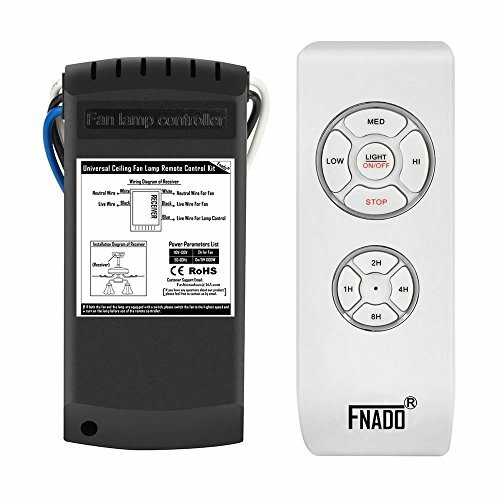 √ [ 1 Year Replacement Warranty ] - Our Total Customer Satisfaction Guarantee - Thank you for making us the Fnado ceiling fan remote control. If you are not 100% completely satisfied, simply contact us to request a refund or exchange ! CE / ROHS Certification! If you have any questions about this product by FNADO, contact us by completing and submitting the form below. If you are looking for a specif part number, please include it with your message.